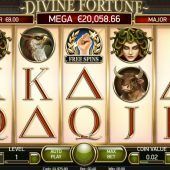 Divine Fortune slot is an action packed 20-line game from Netent. The theme is Ancient Greece and indeed medusa is one of the symbols, along with a Minotaur and Lion. There are even 3 levels of minor, major and mega jackpots which can won via a bonus game. White horse form the Wilds and make up a few of the features as we will see. We will begin with the non-multiplying 'Sliding Wilds' which occur on all reels. Similar to Creature From The Black Lagoon, you will be awarded respins until they disappear from the reels. They aren't actually sticky though, but slide down one row each respin, so if one lands on the top row you will earn at least 2 respins as it descends from the reels. Further to this, if a Wild then lands behind an existing Wild, it expands in the form of a white horse to cover the whole reel, which then reduces to 2 rows on the next re-spin and so-on. Effectively you are getting both single and stacked Wilds in this case during the re-spin feature. It can actually carry on for many spins and accumulate some good wins! During the base game coins appear on the reels. If you land 3 or more you start the jackpot spins, you can also accumulate coins into the Canopic Jar to the right of the reels during the Wild respins too, which then triggers it if you collect 3 or more. You see a screen full of wreaths and depending on how many coins landed or accumulated to trigger the spins, these are placed randomly across the 15 positions. You then get 3 spins which reset to 3 every time another coin lands. You need to fill the top row with coins for the minor jackpot, the middle too for the major and the whole screen for the mega! 3 or more free spin scatters triggers 5 free games. During these any Wilds landing will become the expanding white horse Wild and thus trigger at least 2 repsins. You can still be awarded the re-expansion to all 3 rows if another Wild lands behind this.